"How to land the toughest tee times in public golf"
Even in the age of Google, I've recently gotten this question about a few courses--usually Torrey, Pebble and the Old Course--so it's nice to see Jason Scott Deegan put together a list of the tough tee time gets, and how to get them. Bookmark this for yourself or your friends who ask! He writes about all of the above mentioned and others. The only thing I'd add is this story on East Lothian golf for Golf Digest that includes some links to the courses in that region, including Muirfield. If you aren't already subscribing to Ru Macdonald and Graylyn Loomis' Scottish Golf Travel podcast for all things Scottish golf, here are past episodes to whet your appetite. 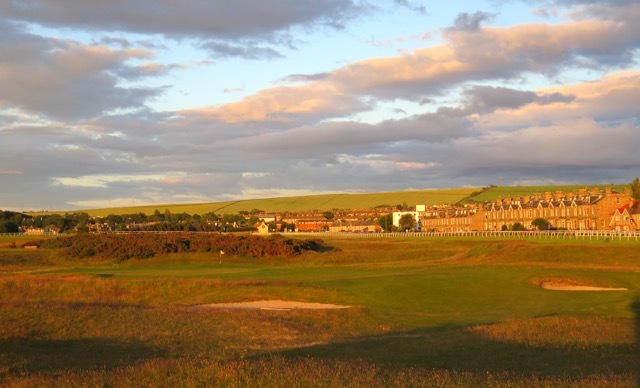 They kindly had me back to discuss my recent trip to Scotland, that included seeing and playing more Highlands courses including the great Cruden Bay and Royal Dornoch, as well as Trump Turnberry, Prestwick and Troon. If you missed it, links to Turnberry review/content here. Prestwick ode and content here. Matt Ginella and I discussed on Morning Drive the approach to a Scotland golf trip, and while we didn't agree on who to trust with the details (tour operator vs Google), I'm pretty confident he would endorse the idea of shipping your clubs. While it's an added expense (up to $500 if the journey is an exotic one), my recent experience confirmed that shipping is a must for Americans traveling to the UK. Yes, it's a tough pill to swallow when you are already spending a lot or worse, if you have status with an airline and get baggage fees waived. But shipping via one of the big services will save you stress, physical effort and in some cases, ensure you get to play your first planned round (or all your rounds with your unbroken set). Consider my recent experience: fly to London's Heathrow airport on my preferred airline (where I have premium status and therefore a "priority" tag on the bag), then have a four-hour layover. Surely the clubs would make the connecting flight to Edinburgh, right? The clubs did eventually arrive in fine shape, though my trusty Sun Mountain travel bag was missing one of its two wheels. However, I was lucky because U.S. Amateur champion Gunn Yang was in line at the same service desk only to learn his clubs never made it out of London. With the recent run of UK events, we know from players making the trip that no matter how famous you are or how obvious it is that you are a professional golfer, the airlines just aren't great with golf clubs these days. Especially flying internationally. Just in the last few weeks, I give you Brittany Lincicome, Stacy Lewis and Graham DeLaet, among others. Oh, and then there was what DeLaet's clubs looked like when he opened his travel bag. For the return journey, Luggage Forward picked up my clubs late at my last lodging locale late on a Thursday. After I had made a leisurely trip to the airport without lugging the clubs, I returned home and by the following Monday afternoon the clubs were here. In between I got email updates on their location. Everything was in perfect order. when they arrived. Either way, just ship 'em. You may miss a day or two of last minute practice and you won't be able to play immediately after you arrive home. But these are small prices to pay compared to missing out on a great links course or having to enlist rentals because the Heathrow baggage handlers decided to hurl your clubs around the tarmac...for hours. **The horror stories just keep piling up with Heathrow and British Airways. Stephen Hennessey with the roundup, including Stacy Lewis and caddie finally deciding to drive to pick up her sticks. And then the real nightmare began.